Food Forests are Motivated by Social, Environmental and Food Justice… Are Those Intentions Sufficient? We’ve marked this day on our calendar’s to remember Martin Luther King, Jr.’s activism for equal rights for all. A struggle that is on-going, not only in the United States, but within all countries and between them. Equal rights refers to a long list that at times seems overwhelming to accomplish. It’s much more than just the right to vote in a political system. Equality, fairness, justice, these themes are entangled in the production of items we use every day and take for granted, decisions we make with our buying power and outcomes of staying complacent rather than being active citizens concerned with the greater good. We need at least one day dedicated to reminding us to stop and take the time to think deeper about how everything is interconnected. But one day is not enough, nor is one blog post. But at least its a start. We need to be conscience on a regular basis and to cultivate our own awareness. Equal rights encompasses many things such as the right to access healthy food, to know where food is coming from, to know the people that helped produce the food were treated justly, to know that the people living near the fields where the food was produced have safe drinking water and air to breath that wasn’t contaminated by pesticides or herbicides, that everyone involved in the systems that exist to get our basic needs taken care of, not to mention those of luxury, are treated equally and have equal opportunity. It’s also about people having rights to forage and gather wild food for cultural or health reasons within cities while respecting the ecology of a site so the resources gathered can reproduce for future users and can fulfill their role in the forest ecosystem. All of these are reasons, along with many others, that interest in community food forests is growing in urban areas. There is a long, long list of inequalities. And it is not simple. It is a wicked problem. Sometimes, when I begin to think about all the inequality, it overwhelms me and I feel paralyzed in where or how to play a part in a solution. This last year was a particularly frustrating one in regards to the multiple examples of police brutality against minorities in our cities along with the violent reactions of the public. It seemed to me that “Changes” by 2Pac should have been playing as the soundtrack but that the wisdom, patience and perseverance of King is needed for stirring dialogue into action and policy changes that will make a lasting difference. We can be active citizens by asking questions about what we see happening around us, in the same way King did and not only dream of a better system, but take the necessary steps towards building it. Knowing that you will meet some opposition along the way. The intention behind community food forests is a positive one, but that does not make it a silver bullet of community development or social issues. Nor, despite efforts at inclusive planning, does everyone come to the table. I was reminded of this when I read a blog post by Elizabeth Walsh reflecting on links between race, Ferguson and food forests. Walsh is now a visiting professor at University at Buffalo, in the School of Architecture and Planning, Department of Urban and Regional Planning and who I personally know is very much concerned with social justice, community building, public health, and environmental issues. Her intentions for helping to establish a public food forest in Austin definitely came from a hopeful heart. Hope that everyone in a community (public, agencies, institutions, organizations, individuals, neighbors, etc.) can work together to design urban environments that serve multiple benefits. Despite an inclusive planning process that involved two years of public meetings for anyone to voice their ideas for what the park should be, and the popularity that Festival Beach Food Forest has had among many, the project, like many others, has faced criticisms and concerns along the way. One article that mentions the Austin project finds the idea of community food forests in stark contrast to equal rights and positive social change. In the blog post titled Frankly, Not About Food Forests, some of the reasons are captured by author Toi Scott. Although Toi is a native Texan, they were residing in Puerto Rico, now in the DC area and to the best of my knowledge, were not directly involved with the Austin food forest. Regardless of involvement, Toi’s article brings up points that are important to consider and that were addressed during the extensive planning process, such as gentrification. Planning takes many forms, apart from the larger public meetings, smaller workshops were held to be inclusive of as many voices as possible. Some meetings were thoughtfully held at an independent living center for seniors and people with disabilities for accessibility. Through dialogue and engagement with the planning process neighbors were able to find common ground in the idea of a food forest since the area had a long heritage of growing gardens and fruit and nut trees. I remember coming across this article in 2013 when I first started my research on this new phenomena of growing popularity on establishing community food forests and being surprised it was the only one I found at the time. Through interviews with many of the organizers of these sites, opposition surely arises due to various issues or perceptions people have when they first hear about the idea or are not directly involved, so they don’t understand or have all the details about the project. Throughout the two years of planning, a large coalition of interested parties was established in Austin for advancing the project including PODER, Austin’s grassroots environmental justice organization, which had been advocating for food forestry in public parks for many years before the idea of Festival Beach Food Forest emerged. I’ve since found other articles, also written around 2012/2013. This article happens to call attention to Mesa Harmony Garden, but does not put any information for an author behind the voice that attacks the food forest managed by a partnership of a nonprofit organization, religious institution and community members. Nor do they state or link to where any of the information is sourced. Mesa Harmony Garden in Santa Barbara, CA, which I also know from personal interactions was established and continues to be managed with positive and meaningful intentions. Anyone from the community, regardless of religious affiliations, is invited to join the group that helps with the food forest. These articles shouldn’t be tossed aside as naysayers or people being negative, but embraced as opening a door to see a different perspective that we may not have seen or intended to exclude. People with contradictory opinions from ours help us consider all the angles of a project. Their opinions are valid because they voice concerns others may be feeling as well which could bring down a project if not addressed. Looking at the root of criticism gives insight to issues that need consideration if we care about equality, justice, and making a place for all to feel welcome. Community food forests are not easy answers nor are they easy. Community engagement is not easy. How do you want to help people’s perception change? Why do you want to change them? Are you willing to listen to them first to understand where those perceptions are rooted and if they have wisdom to share? Are you sure they want to be engaged with a food forest? I urge those involved with establishing a community food forest to plan with as much diversity at the table as you can. Do not be disheartened by the opinions of some, but look to see what can be gained from their concerns. Be open to accepting that a food forest may not be what the community needs or wants as the primary project. We all have the ability to change our perception. I’ve posted some question below that I think help get conversations started, but these are just a few that should be considered of a much longer list. Expand it according to your site’s unique situation. While natural material paths, such as mulch, are great and add to the “forest” ecosystem of a food forest, are the wonderful edible plants reachable by those that are challenged in walking, or need wheelchair access? Did you include the neighbor population in the planning of species, design and potential uses of the space? How did you include them? Was it using language or visuals that could be understood by a large range of people regardless of their reading ability or native language? Were materials translated into relevant languages? Freedom Square Food Forest maintained by the North Troy neighborhood and the Sanctuary for Independent Media. Those of us involved in food forests think they are a fantastic use of space. Is your target audience or neighborhood of the same thought? If not, what do they really need, are you being open to listening? Is it something that can be incorporated into shared space with a food forest? I think the food forest in Troy, NY that borders a a corner lot known as Freedom Square is a great example of providing for other needs along with the edible plants. A mosaic mural stage involved community members to put up quotes they picked along with photos that called attention to violence in the neighborhood. The stage is used for peace rallies, summer concerts and is open to the community along with a bike path and bbq. Here is another good example from Asheville, NC involving a community garden to bring people together. And yet another one that has provided fresh food and income to the local residents who take the produce to farmer’s markets. I have had the pleasure of visiting this garden and it has fruit trees incorporated all along the side of it. 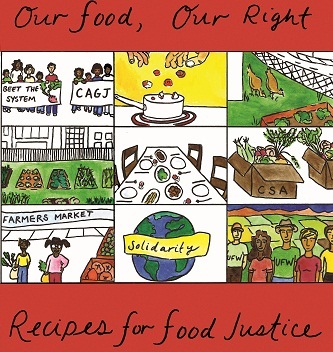 community food forests, equality, food justice, social justice. Bookmark. What Role Do Community Food Forests Play in the Food System?